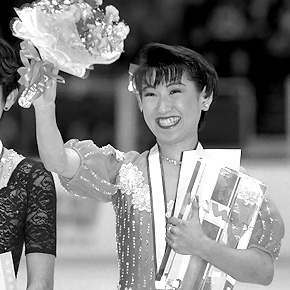 Home / Posts tagged "Barbie Long"
All posts tagged "Barbie Long"
Japan’s Midori Ito, the 1989 World champion and 1992 Olympic silver medalist, was the first lady to land a triple Axel in international competition at the 1988 NHK Trophy. was also the first lady to land a triple-triple jump combination in competition (1982 Junior World Figure Skating Championships). was the first lady to land seven triple jumps in a free program (1988 Olympics). Which ladies are working on triple Axels and who is your favorite? Discuss here!